All about unused stuff in video games, different-looking early footage or prototype documentation. This is all old as balls and kind of irrelevant in the wake of such dedicated efforts as The Cutting Room Floor Wiki, but some sites still cite it as a reference source so it's still kicking around. Sprites were used to cover up the kanji and the soft drink promotion. Apparently the only regional change in the game is the announcer, with a different pronunciation of the title in Japanese. These two mugshots are unused, hence their default YY-chr palette. The left one looks almost like Doraemon, while the other looks like something from Ufouria. The water magician in stage 2 has a wider range of animation that isn't seen outside of the graphics data; only the two sprites on the left and the frame of him keeled-over are used in-game. You can throw while jumping, while running and while crouching, but you simply cannot throw upwards. They did use the first frame of the skinny animations, as well as the last one for the female during the credits for them looking up at the "The End" text, but the chubby ones go completely unused. I'll be blunt. I swear I saw a magazine scan on the internet of an early menu screen from Final Fantasy VII, showing full-body sprites of Cloud, Aeris and the like. I can't find it anymore, but I swear it existed. So I hoped to still find them inside the data! This was all I got. Some Japanese text bundled with where all the menu mugshots are. These are not the graphics I was looking for. 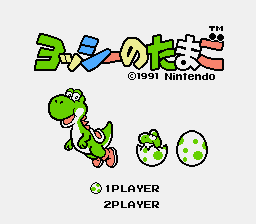 Also known as simply "Yoshi" in countries where descriptive titles aren't a necessity, though not like ours was very explanatory either - the European and Japanese versions share the same title screen, the only difference being the updated copyright and the logo, of course. 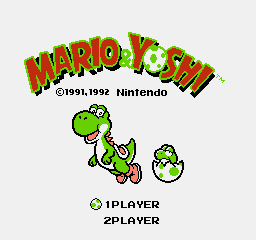 But the American version not only adjusted the positioning of things for the sake of its title, but they redrew the baby Yoshi for reasons unknown. Those wacky funsters! The NES version, meanwhile, shares no same positioning between them all, besides the option select. 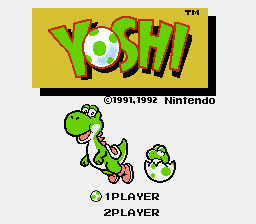 The American one slaps on a larger title and lowers the characters, removing one egg and redrawing the baby Yoshi, while the European release moves them again, still keeping the redrawn sprite. And apparently a Bullet Bill was going to be one of the enemies the Yoshi egg could gobble down in the Game Boy version, but that's all there is - the four enemies you do see all have a spare graphic presumably used for score tallying or something, but there's none for this guy. It doesn't show up anywhere in the NES version, though. Pretty much everything here is different; the map, the HUD, the graphics, everything. Plus, I honestly can't remember if you can get any higher than 10 spaces to move in the game. I like how the mushrooms were once dice. Makes sense, considered they shatter every time you hit them. I don't recall ever seeing this area in the game. 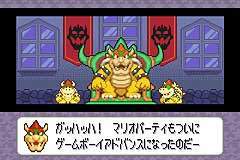 It's a terribly bland looking place, but what's interesting is that not only is Bowser's sprite different, but there are two Mini Bowsers! The only times you see more than one are during mini-games. 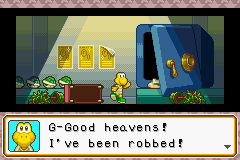 Also, the text box and Bowser's mugshot are different. The bank itself is essentially the same, other than a few minor details changed: The peeling poster is lacking the shading, the bank once had windows, the knocked over plants are different, and most importantly, outside the light is pitch black, instead of merely dim. 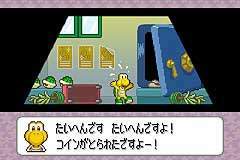 Plus, Koopa's sprite is different (and looks better, in my opinion. the game looks like he's doing a jig instead of panicking), and so is his mugshot. 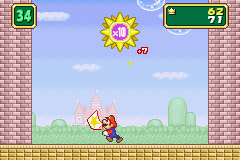 The prerelease lacks walls, Mario has a different sprite and fan, and the score sun thing has a bold outline in the prerelease, along with bolder colours. Note how the prerelease has a blue marker, and it says "+10" instead of "x10", which is more correct, considering your score is never multiplied by it, but the number shown is awarded for popping balloons. The background is coloured and styled differently: The prerelease has very top-heavy stars, that are all facing up or down, with straight lines. The final has more even stars, with some stars tilted. The ground was original black and white, but is now purple and white. The original stand for the shells was a platform, but in the final, it's a giant shell. The pipes were originally curved, but are now straight. Doesn't look like they changed colour either. 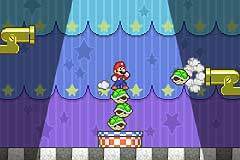 And finally, not only are the shells' sprites different, but they lack colour; although they may simply have had a high score, where they only change colour after you get higher than said score. And Mario always looks at the screen, instead of daring the shell to a match of fisticuffs. Mario's sprite looks mildly different, but I can't really tell. 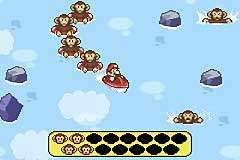 There doesn't appear to be a path, what with the water being a single colour; and you have to rescue 15 monkeys (all in the same red rubber ring) in the prerelease, but only 10 (in different coloured rings) in the final. The monkey gauge is also squared, but more oval in the prerelease, and there doesn't appear to be a timer. The ground was once dirt instead of bricks, the audience stand walls were more gritty and dark, but are smoothened in the final. The duelling swords is missing on the flags in the prerelease, and are also different on the wall. There's only four Hammer Bros. in the audience, but lots more in the final, with different sprites; and finally, and most importantly, there were once platforms, which would've added an interesting twist to tactics! And last but most obviously, the life bars were moved apart and to the top. The wall in the background is different, with altered bricks, moss, and holes. 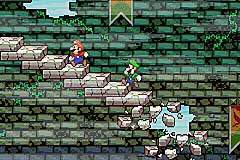 The stairs are quite different, as the final's stairs are small blocks, but the prerelease's ones are larger, and crumble instead of falling and shattering. And, as usual, the sprites may or may not be different, the quality isn't high enough for me to tell. 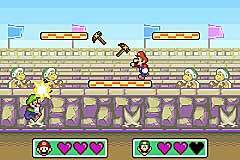 New Super Mario Bros. was first announced in May 2004, named Super Mario Bros. DS, and was accompanied by some very early video footage showing basic gameplay. It's incredibly early footage, as the graphics are all weirdy, there's no music, the programming is wonky, and the sounds are misplaced, missing and totally unfitting. 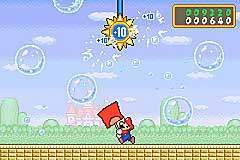 Mario performs numerous backflips with ease, an ability not in the game; the jumps in general are very odd, sending him higher into the air than usual. Also, all the enemies are 3D models, but most of them are 2D sprites in the final. And then there's a Goomba growing from a mushroom, which is just plain wrong, although a giant Goomba does appear as a boss. I won't even comment on giant Mario crushing Bowser in a single stomp in the middle of nowhere. None of the areas shown or their graphics appear in the game. And then there was another video, released in Summer 2005, which was much further along in production, looking much more complete. Firstly, the HUD was seen, and drastically different from the final. The coins and timer were moved to the top screen, it lacks the World #-# part, has no slots for the star coins, and has three stored items instead of one. The lives counter also uses a different mugshot for the characters, and always seems to be above 70. 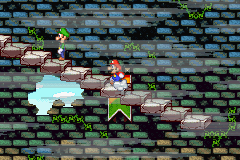 The distance is also more bland, with a generic flag at the end, a green bar instead of a dotted line, and no indication of the mid level checkpoint. It does, however, tell you the useless fact of what level you're in, like FORTRESS, DESERT, SEA and so on. The Mega Mushrooms are also different. 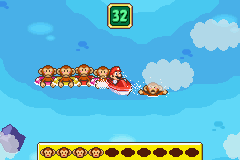 The video shows them with the default colour scheme of red and white, whereas the final makes them a reference to the original Super Mario Bros., making it yellow/orange and red. The stomping gauge doesn't come up when Mario collects it, though. Speaking of giant Mario, he can punch and kick in the video, two moves he lacks in the final, and for good reason. They don't seem to do a thing except slow him down. 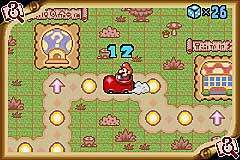 In the parts with giant Mario, there's also a giant Goomba wandering around, but they're not regular enemies. 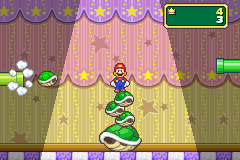 It's not shown if it serves the same purpose, but this swirly ring which creates eight red coins and a time limit in the final is shown in the video a number of times, except it's blue. It's orange in the game. Mario reaches the end of a level, pulling down a blank red flag and exposing his hair in celebration. However, there's no fort, and the flag lacks the skull design it has in the final. The background used for the fortresses is different, and the ? Blocks are yellow, but the yellow brand are only in outdoor levels. Fortress levels have blue blocks. This area simply isn't in the final. There are no desert levels with tornados. The tornados are fairly clearer in the final, compared to this dirty-looking one. And the biggest change of all, is that this video quite clearly shows CO-OPERATIVE MULTI-PLAYER. Well, maybe not co-operative, considering Luigi bounces off Mario's head a number of times, but it's SIMULTANEOUS MULTI-PLAYER none the less. And it looks fully programmed. They interact with each other rightly, and all the right coding seems to be there. Yet, despite all that, and the fact it's the first traditional side scrolling Mario game with simultaneous multi-player, they removed it from the final game. Can you guess what they replaced it with? A star collecting battle game. Next time, Nintendo. NEXT TIME. esreveR tells me that although the second game has five weapon slots and the first only has three, apparently five were coded. Value 00 is blue, 02 is yellow, and then it skips to 06 for red. 04 would've been green but acts/displays as yellow, and 08 would've been grey, but shows up as blue. And then when they programmed them in for the second game, they ditched it for the third one. Oh well. Here's a screenshot from the final. 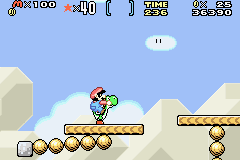 Note how the "MARIO x #" part became "M x #", the Dragon Coins were moved to go below the lives, the star points were adjusted to the top, and the item window became two brackets. The title screen of Super Mario Land 2 is different from the English and Japanese versions, but according to an old Game Boy advertisement that I pinched from the Super Mario Bros. Info Station, the English one had another title screen! It's pretty poor looking, in my opinion, what with a sign that has a ton of empty space, and a terribly bland logo. I'm glad they changed it, although the final title seems a bit empty, what with only the signpost and mushrooms there. Despite the fact there's a beta of the game floating around on ROM sites, there's absolutely nothing different between it and the final release. Nothing! Which is a shame because the game feels unfinished, and I was hoping for proof. It's probably one of those cases where the final game was found in a not-final cartridge or something. EPROM or whatever. However, there's unused text in both versions of the game that's the same, and seems more than a little out of place. IN NOVEMBER OF 1984, SHORTLY BEFORE GORBACHEV CAME TO POWER, A TYPHOON- CLASS SOVIET SUB SURFACED JUST SOUTH OF THE GRAND BANKS. IT THEN SANK IN DEEP WATER, APPARENTLY SUFFERING A RADIATION PROBLEM. UNCONFIRMED REPORTS INDICATED SOME OF THE CREW WERE RESCUED. BUT ACCORDING TO REPEATED STATEMENTS BY BOTH SOVIET AND AMERICAN GOVERNMENTS, NOTHING OF WHAT YOU ARE ABOUT TO SEE... ...EVER HAPPENED. Tom & Jerry isn't about submerged Soviet submarines! This is actually text from another game by Hi-Tech Expressions, The Hunt For Red October, which is actually about submerged Soviet submarines. It's located between the ROM header (which calls the game Super Tom & Jerry, though the box and title screen lack the prefix) and the credits, which is slightly odd. On November 12, 1984 approximately four months before Mikhail Gorbachev took power in the Soviet Union, a Russian TYPHOON class submarine surfaced briefly in the Atlantic just north of Bermuda. It was subsequently sank in the deep water after suffering massive radiation leakage. Unconfirmed reports indicated some of the crew were rescued. According to my repeated statements by both Soviet and American governments... Nothing of what you are about to see... EVER HAPPENED. Beta text of a different game inside another beta that kept the text into the final! Wacky stuff. And for those who can't read long sentences at a time, it's more or less the same, except the final text makes better use of the English language. "Sank into deep water." Honestly. It's called the ocean, people, and I don't think it likes being called deep water. Maybe very deep water, but not without that prefix.